Timothy F. Burr began his legal career in New Orleans in 1979 as an attorney in the maritime section of McGlinchey Stafford. He became a Director in 1983 and in 1987 formed Galloway, Johnson, Tompkins & Burr with John Galloway, Mike Johnson, and Jim Tompkins. 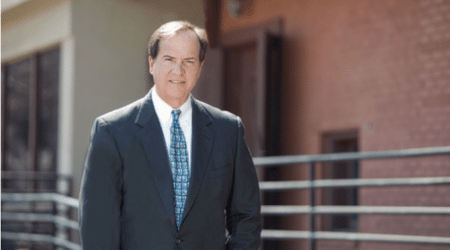 Over the years, Tim litigated hundreds of cases and had considerable trial experience in State and Federal Courts throughout the Gulf South, obtaining many favorable verdicts and judgments for the Firm’s clients. In 1995, Tim was selected to become the Firm’s Managing Director and during his tenure, the Firm grew to 7 offices in 5 States and became widely diversified in its practice areas as well. In 1996, Tim moved with his family to the Pensacola Bay area to head up the Firm’s first Florida office. He continued to practice in Louisiana, Texas, and Florida while serving the Firm as Managing Director until 2005 when he elected to devote more time to family and community activities, and during work to concentrate on the Firm’s Florida operations. He served as a member of the Firm’s overall Management Group and continued to consult on cases primarily in the admiralty, real estate, and professional liability areas until June of 2017 when he retired. For over 30 years he maintained Martindale Hubbell’s highest ratings for competence and ethics: AV. After 30 dedicated years to the firm, Tim Burr retired in December 2017.